Two albums containing a total of 129 gelatin silver prints, each approx. 3½ x 5¼in. (89 x 133mm.) or the reverse, one inscribed in ink My dear Mr. Ellsworth! Please accept this photograph - book as a small acknowledgement for all genialness you have shown us. Yours very truly Odd Arnesen. Ingo Möllerstad on front free page, string bound leather covers, one titled Til Minde om. Amundeson - Ellsworth Polflyvning 1925 [In memory of the Amundsen - Ellsworth's Polar flight 1925] on upper cover, oblong 4to. together with a copy of Amundsen and Ellsworth, Air Pioneering in the Arctic, New York, 1929. With the development of aviation in the early 20th century, Roald Amundsen had declared in a lecture in 1914 that 'the future of Arctic exploration lay inevitably with the aeroplane'. Over the next ten years Amundsen made several unsuccessful attempts to reach the Pole in various aeroplanes. On the verge of financial ruin as a result of these attempts, he managed to obtain further funds from Lincoln Ellsworth, an accomplished sportsman and son of a millionaire, and in May 1925, set off once again to conquer the North Pole by aeroplane. Lieutenant Hjalmar Riiser-Larsen was in charge of fitting out the two Dornier-Wals seaplanes. 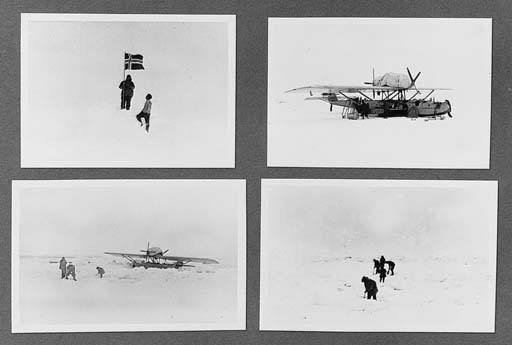 Amundsen and his men took off from Spitzbergen on May 21, 1925, planning to explore the area between Spitzbergen and the Pole for the first time, leave one of the planes at the Pole, and fly on to Alaska. They ran short of fuel and had to land on an ice floe after eight hours, 136 nautical miles short of the Pole. After compacting snow and ice to form a runway and discarding most of their equipment, one of their planes managed to take off on 15 June. Within sight of Spitzbergen the flight was aborted at sea near North Cape and the crew was rescued by a sailing ship.